This page fills the remaining slot among my 2007 pages. I was going to just do one page on going to Murray State games in general, but I decided I have too many cute basketball pictures to lump them with these two from a football game. 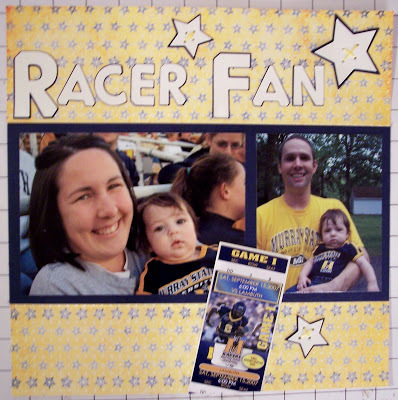 So, here’s the football version of “Racer Fan.” No worries, a basketball version is still to come, and probably with more journaling because Cate was much more into the atmosphere at the basketball games, which admittedly are more entertaining! Adorable page! Can’t wait to see the basketball version. So yesterday I sat on the couch for like 20 minutes to eat something and I was flipping through the channels and saw that HSN had a scrapbooking show. So I turned it on and it was like a sales thing where they were demonstrating this awesome machine that prints off decorations in plastic, fabric, etc. It’s like a computer too so you have this wide array of options. It’s $549. Wow. I was shocked. I saw that same machine. I was mesmerized. I think it was called a Pazzles. I really like this page too; failed to mention that in my last comment.